If the school district lines in the far northern Twin Cities suburbs has been drawn just a bit differently, perhaps by an Andover High boys hockey fan, St. Francis goal-scoring phenom Joey Benik and Huskies playmaker extraordinaire Cal Decowski easily could have been teammates. Almost as good was Benik, who won the state’s goal-scoring title with 53 in the regular season, squaring off against Decowski, who led the state with 50 assists. Both are seniors and Mr. Hockey finalists who, unquestionably, are the best players in their respective programs’ histories. 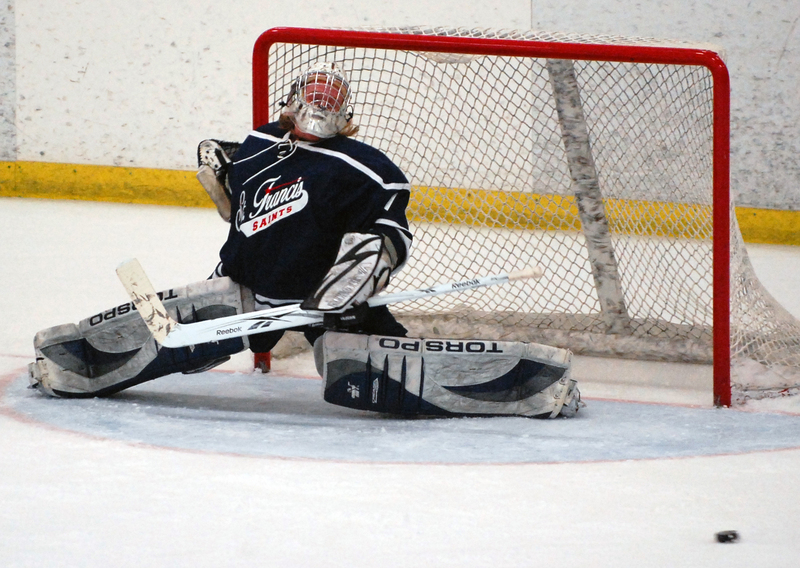 Benik had a goal and an assist and used his eye-blink bursts of speed to streak in on two breakaways, both of which were stopped by Andover goaltender Matt Ray. Decowski, meanwhile, had a goal and four assists, setting his teammates up for such easy goals they were to hockey what two-inch putts are to golf. 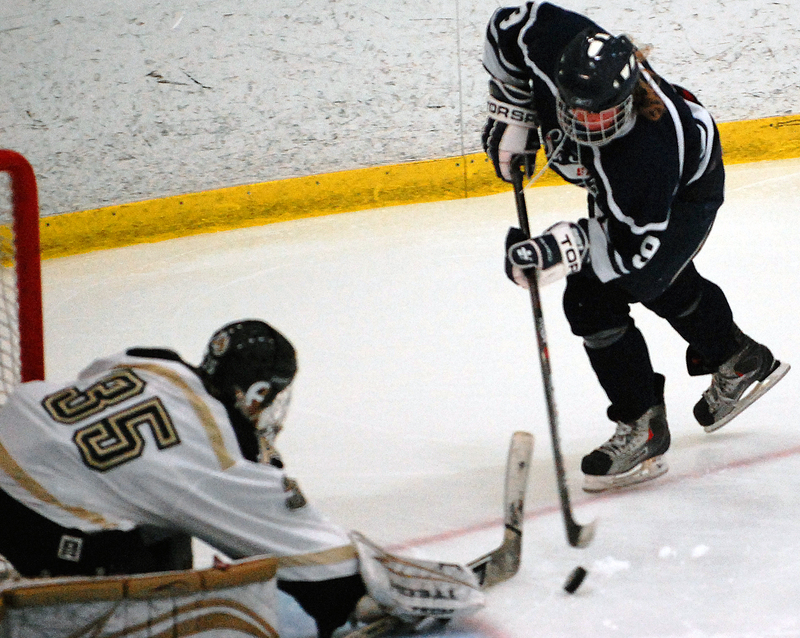 The victory marked the first section quarterfinal triumph in the Andover program’s nine-year history. After years of suffering heartbreaking losses at this same stage in the playoffs, the No. 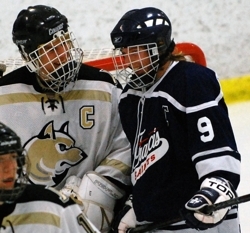 3-seeded Huskies (17-7-2) nervously found themselves entering the third period in a 2-2 tie with the No. 6 Saints (16-9-1). 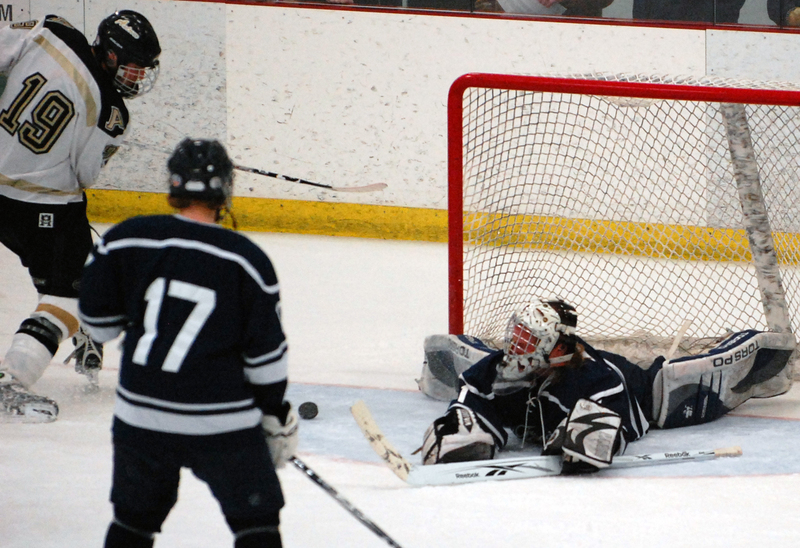 St. Francis forged the tie on a Dylon Koran goal with 1:55 left in the second. That goal had Portner banging his stick against the boards in frustration as he left the ice after the period. Meanwhile, Ray was wondering if the Huskies had been hit with some sort of freaky playoff hex. After that, well, after that Decowski became hockey’s version of Minnesota Fats, dishing passes to teammates from angles only a world-class billiard player could understand or appreciate. Indeed, on some of Decowski’s set ups, all that’s was missing was the old hidden ball trick and buckets of confetti. 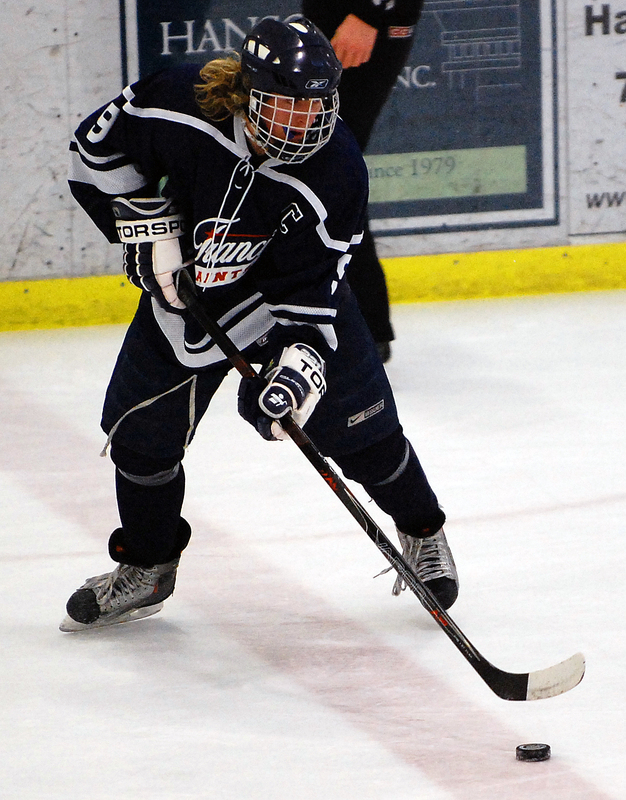 Decowski routinely threaded passes through heavy traffic to open teammates, passes that were so improbable they sometimes caught even Huskies players off guard. 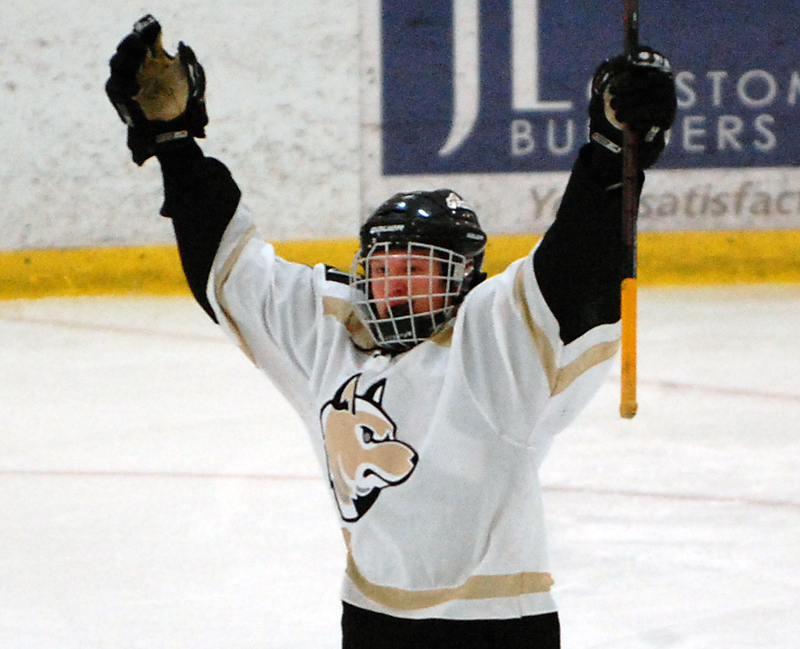 Andover advances to play Duluth East at 2 p.m. on Saturday, Feb. 27 in the Section 7AA semifinals at the Duluth Entertainment and Convention Center. Meanwhile, Benik’s brilliant career comes to a close. “Just all my friends that I have grown up with,” Benik said when asked what he’ll remember most about his high school hockey career. “Getting involved in the community, hanging out with the young kids, going to birthday parties, having them sit on the bench with us. Hoops said Benik, who had offers to play in multiple junior leagues this season but chose to stay home for his senior year, has helped transform the St. Francis program. 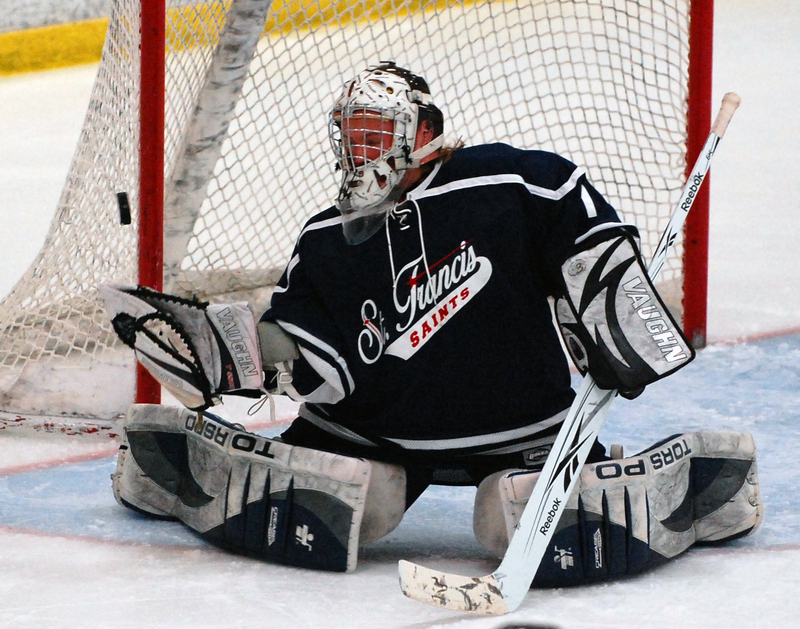 He said the excitement and interest generated by the Beniks (Joey’s twin brother, Andy, is the Saints’ goaltender) has sparked conversation about growing the St. Francis youth hockey program and, possibly, building an arena in the community. “Obviously he’s the best St. Francis has ever seen,” Hoops said about Benik, who had 65 goals and 101 points as a junior. “Going out and doing a lot of the same thing all over again. I think he wanted to let people know that it wasn’t a fluke that he could play at that level. Decowski chatted with Benik on the ice after the teams’ postgame handshake. They talked about the upcoming Mr. Hockey awards banquet, which will be held the Sunday following the state tournament. 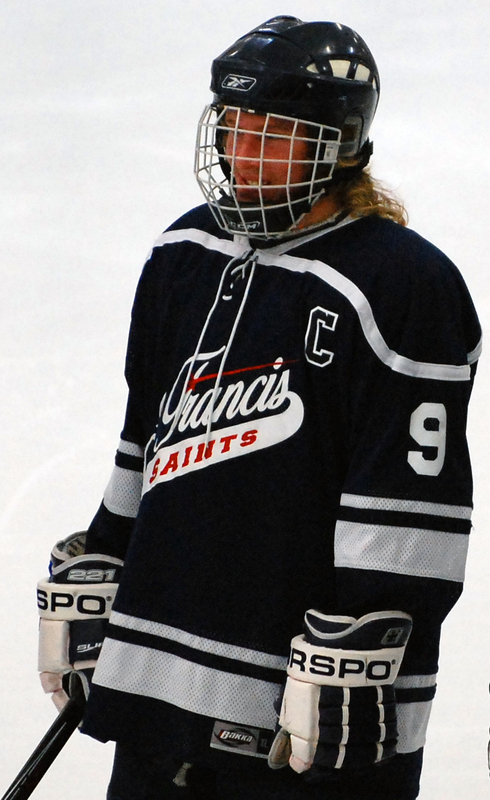 Decowski said he’s wondered, too, what it would have been like to have been teammates with the St. Francis star. 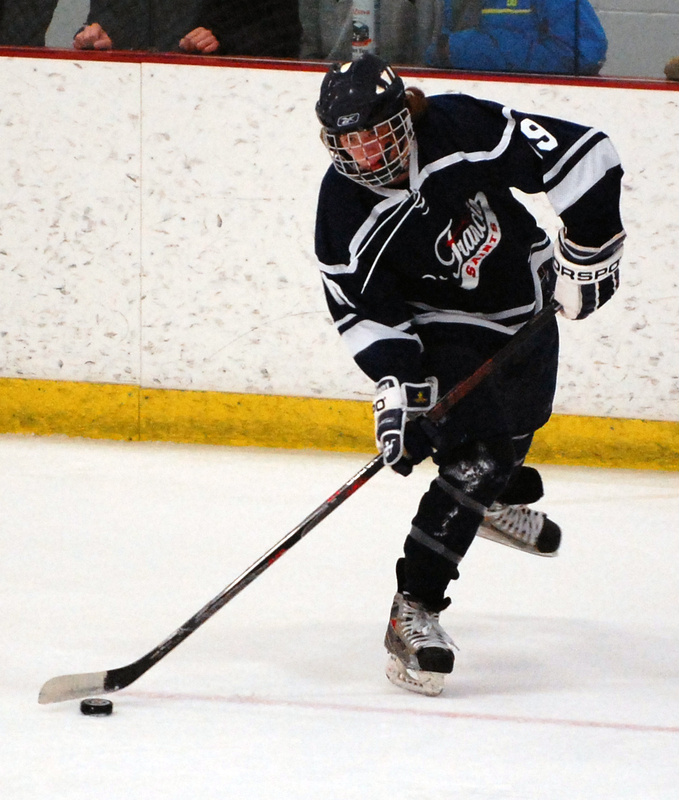 Huskies senior and Mr. Hockey finalist (pictured below) put on a passing exhibition in the third period, setting up three of Andover's four goals as the Huskies turned a 2-2 tie in a 6-2 runaway. Not only does the Huskies senior have a knack for putting the puck in the net, he gets high marks for energy and enthusiasm during his post-goal celebrations. 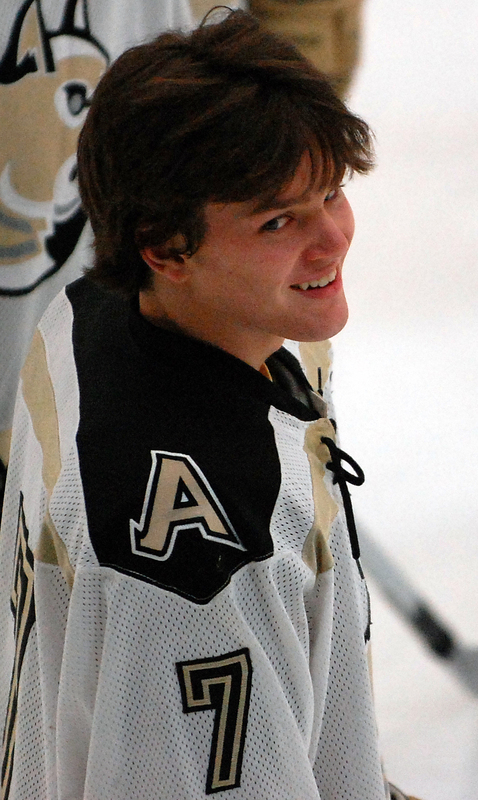 He scored three goals and, immediately after each of them, crashed into the glass in front of the appreciative Andover student section. 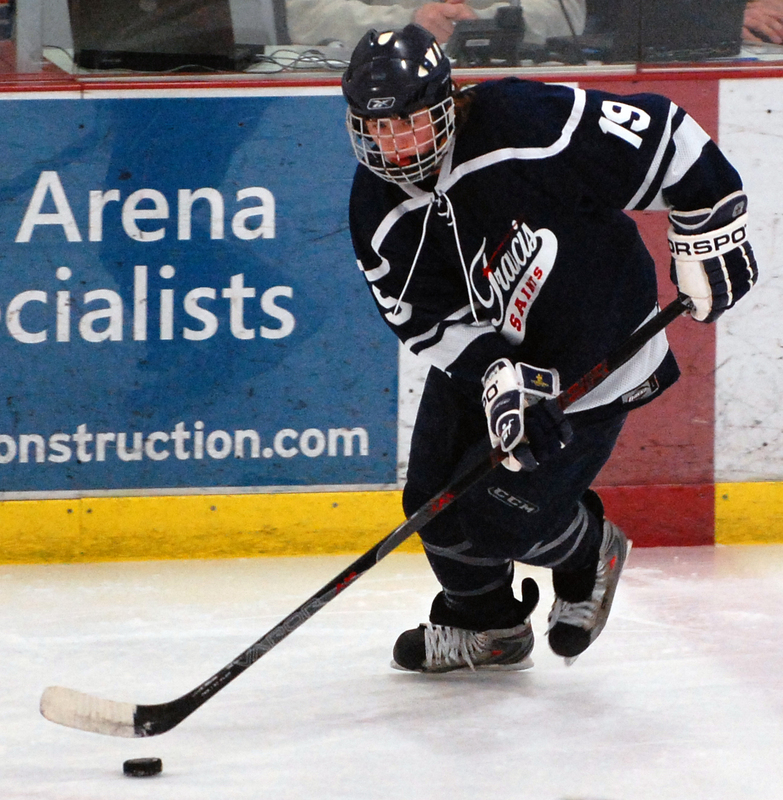 Scored a goal, added an assist, missed on a breakaway late in the third period and was on the ice the majority of the game, showing the speed and puck skills that made him a Mr. Hockey finalist and one of the state's all-time great scorers. 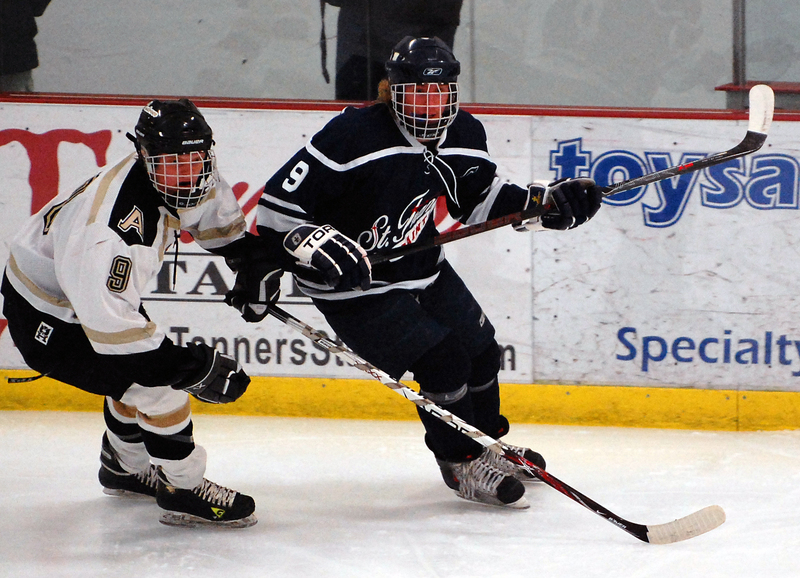 Two of the state's 10 finalists for Mr. Hockey, awarded to the state's best senior hockey player, were on the ice for Tuesday's Section 7AA quarterfinal game at the Andover Community Center. 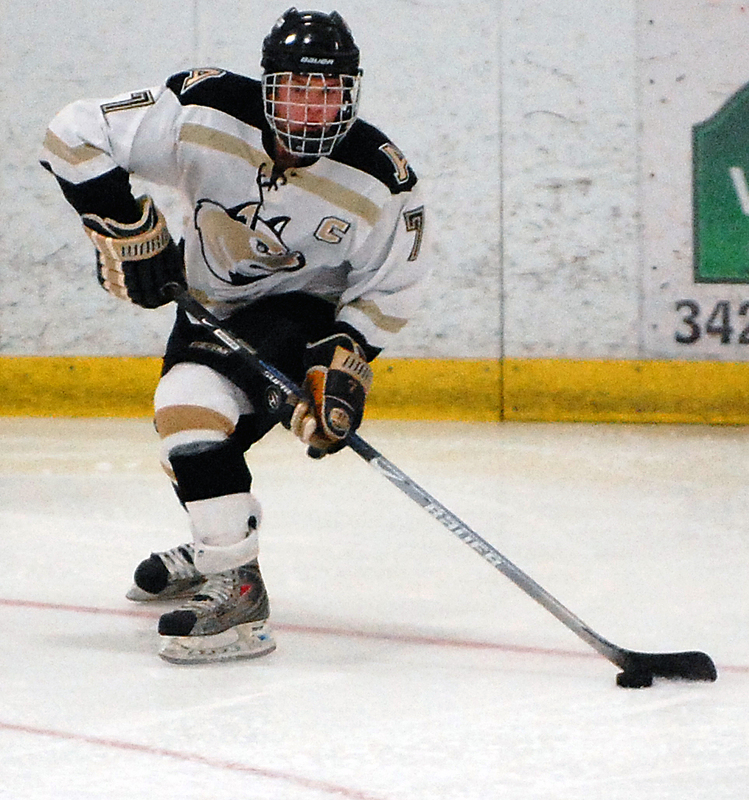 Sharing the ice sheet were St. Francis' Joey Benik and Andover's Cal Decowski, who scored a combined 174 points during the regular season. Benik, who has committed to St. Cloud State, shared the state scoring title with Detroit Lakes' Tanner Lane with 90 points while Decowski (still uncommitted) finished sixth with 74. 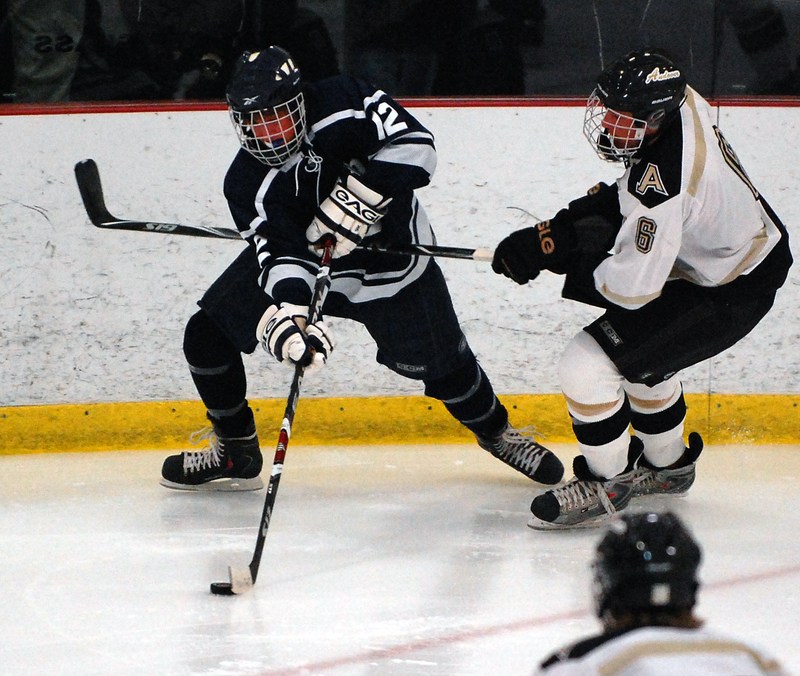 In a confrontation that had the packed house roaring, the two did, literally, collide at the St. Francis blue line late in the first period with Andover on a power play. There were scoring chances from start to finish in the second period. The goals came early and late, too. 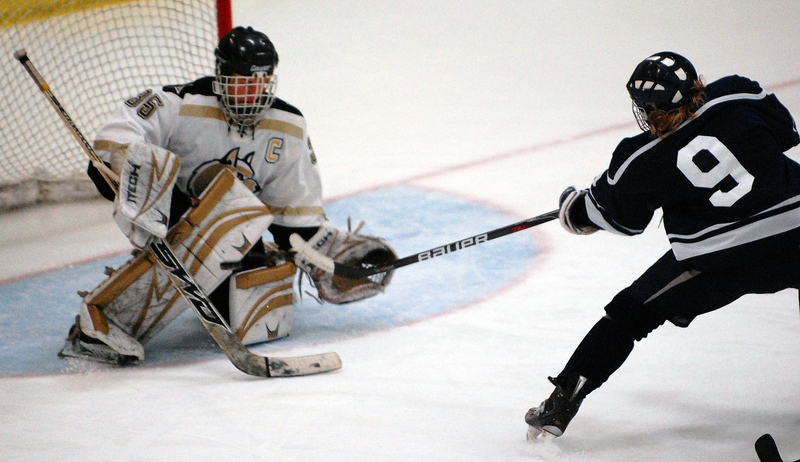 Cal Decowski put Andover ahead 2-1 just 23 seconds into the period when he scored from close range. The score stayed that way until the final two minutes, when a wild flurry of St. Francis scoring chances ended with Dylon Koran jamming the puck home. That goal came with 1:55 left, tying the score at 2 and injecting life into the Saints. Although two of the state's top scorers were on display, Tuesday's game wasn't all about offense. 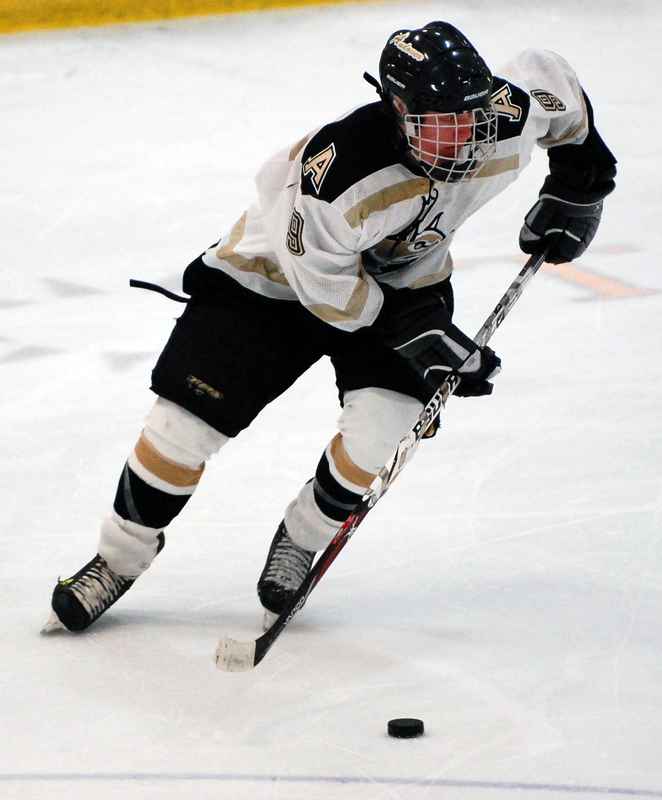 One of the biggest hits in the second period came in open ice when St. Francis defenseman Tyler LeBeaux sent Andover's Davis Tollette flying with a hip check. Joey Benik, who has committed to play at St. Cloud State, said he'll play next season for the Penticton Vees in the British Columbia Hockey League before joining the Huskies the following the season. The Vees' coach and general manager is Fred Harbinson, who spent five seasons as an assistant coach at St. Cloud State. 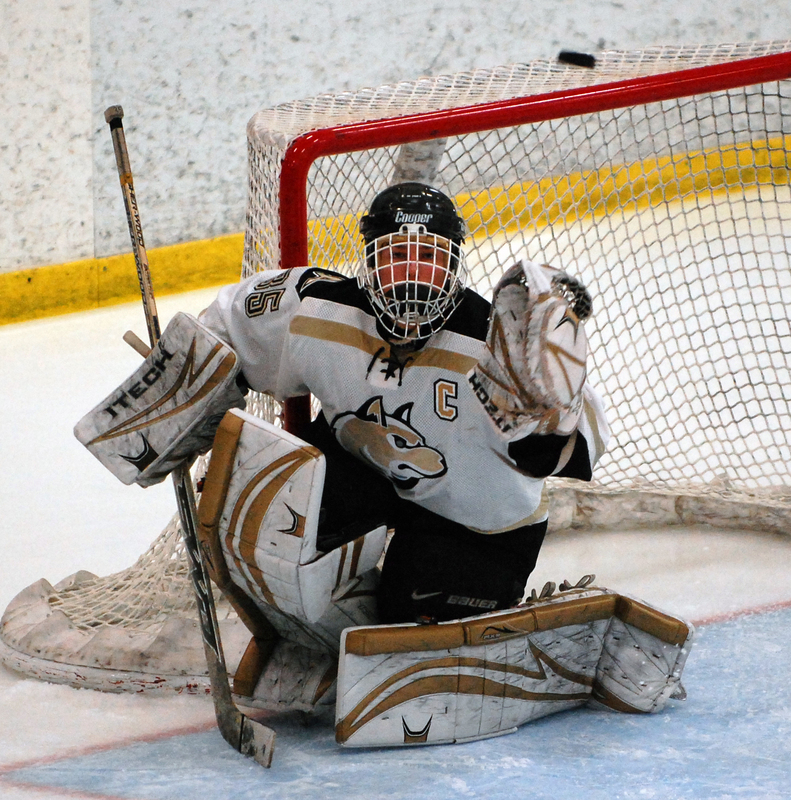 Andover senior goaltender Matt Ray twice stopped Benik on breakaways. After Benik failed to score on his second solo rush, which came late in the third period, the two had a good-natured exchange of words. "He asked me how many I was going to get on him, and I told him I wasn’t going to score any on him, I was going to score them on empty nets," Benik said with a smile. Ray said he is familiar with Benik since their days playing youth hockey in neighboring communities. "I’ve grown up with him since I was a little guy," Ray said. "I know a few of his tricks, but I don’t know if he’s got new ones, so. … It’s just wait, wait, wait and then once he goes for that last move, get there as fast as I can."